Looks like the US is making a move in Venezuela. Maduro is still in power. He was to be gone years ago. Seems to win elections on a regular basis also (probably more valid than US elections). But we shall see– the US would really like to get their hands on all that oil. Just like New Guinea: over pigs and women…. They will help the climate get worse!! Yeah, but if you’re wealthy flying first class on commercial flights is just so pedestrian. Got to have immediate personalized service with a big open cab to yourself, an in flight desk, maybe stretch out and take a snooze or get on an exercycle. Just too confining on a commercial flight and then there’s all those dumb rules like being buckled up most of the flight. Ok, where are the chocolate liqueurs! I read in Reuters a few years ago..That the former CEO of GE used to fly in his own private jet and had a second identical private jet follow behind him everywhere..Just in case there was a small chance that his plane would have mechanical issues..Not kidding. In fact very few people understand the hardship, paranoia and emptiness when reaching top of the social pyramid, i.e. most of the time it’s not about being the fat cat at all! For one thing, you have to maintain your weight to stay fit and reach the desired longevity (supposedly enjoying the wealth status), and that at certain age, say after ~45, means keeping 24/365 certain level of hunger periods, because you can’t exercise so much anymore. Also, the expensive and privileged toys as you nicely demonstrated are completely out of your control in terms of operational procedures (few owner pilots), maintenance, and service. Moreover, you have to socialize with almost exclusive club of other sociopaths only. And always on the alert about possibly new antagonistic social movements and political developments. Hence the motivation to enter such club can be explained only as some sort of satanic cult chain-gang calling, well only the bird’s eye viewpoint might be nice, although achievable through other means for normal people as well. So in summary, who is the truly rich and enjoying the life fully in the end? Sometimes when I see scenes like heavily obese south american guy in dirty tshirt (~working class ) performing large and loud barbecue for this 5x kids and ~20x other relatives and friends mingling around happily, one has to wonder..
People will pay lip-service to the adage that money does not buy happiness but of course most secretly believe that it does. The truth is though that abundance is actually a state of mind that entails being grateful for what you have in the here and now. Given that the very wealthy tend to be driven by a bottomless sense of lack, their wealth ironically fails to translate into a feeling of sufficiency, let alone abundance. And if the global economy can be understood as a thermodynamic heat engine, these driven individuals are the cogs doomed to spin fastest. Pathologies tend to eventuate in their relationships, marriages and offspring. One thinks of the Inuit, some 60-odd years ago, quoted in ‘Last Kings of Thule’ who defined happiness as a full stomach and a ‘plump and cheerful wife’. Having a full stomach implied, of course, being a good and lucky hunter, too, in a stabel ecological environment. And the whole set-up implied also a stable society, and equality between families. This is certainly not the world of the rich, nor of most of us. It is not the life pushed on us by advertising, proposed to us by Neo-Liberaliam, nor the one dreamed of by radical-Left revolutionaries (all those indoctrination sessions, perpetual Revolution, hunting out of enemies, worship of the Great Leader, the annihilation of individuality and the spirit, etc). 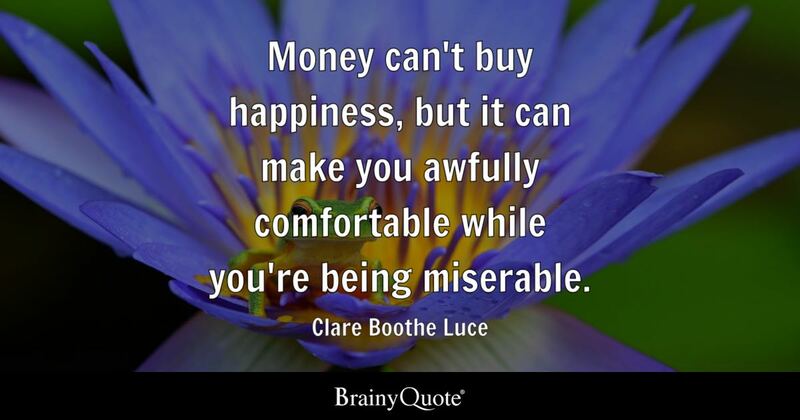 There are surprisingly few people who believe that money doesn’t buy happiness. I know I lived in a variety of apartments and houses over my lifetime. I discovered as a teenager, when my parents had the nicest house in a small town, it was, in fact, not as good a situation for me as when they had had a modest home across from a garage mechanic and his family. As a graduate student, I ended up in some quite modest apartments. Later on, at one point, we bought a house on a small lake and I had a decorator help me decorate the house. But the decorator-decorated house wasn’t quite me. When we moved later, I chose a home with more modest looking decorations, in a modest subdivision, living in a neighborhood that is convenient for my son who doesn’t drive. It is difficult to go backwards. If your wealthy, your baseline is higher than most. However, this baseline is still their minimum expectation in life. No matter if it seems superfluous. The same goes for middle and lower-class incomes. Electricity and iPhones and cars are the baseline. It is hard to accept less than our learned baseline standard of living. 1/ what their parents have or had, and 2/ what immersion advertising tells them they should have (not so much the promises of politicians, as they are (unsurprisingly ! )very careful indeed not to be too precise. And indeed what the social environment tells them they ought to have: peer-comparison. Young Left ‘radicals’ in Europe, for example, angry at Capitalism, feeling short-changed by it, and seeing that they are falling below the baseline as portrayed in the media, suppose that if they overturn it, they’ll get all the goodies. 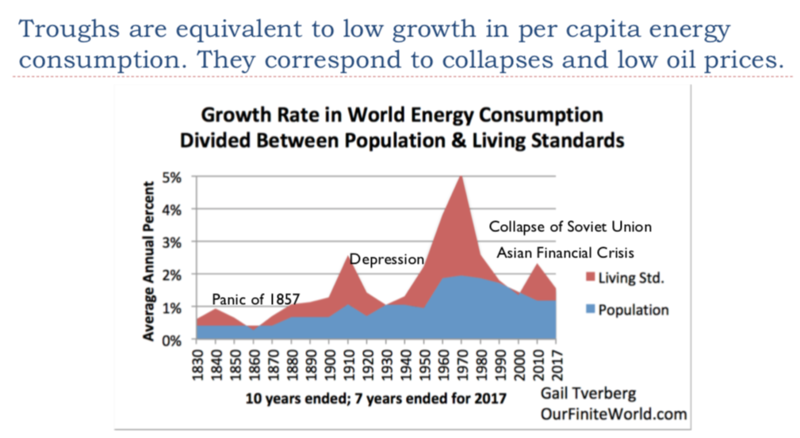 They are completely unaware of the energy per capita factor in all of this, and see it as a problem with a political solution – just like ‘eliminating global poverty’. …..
Moving from poverty to riches requires the expenditure of energy. 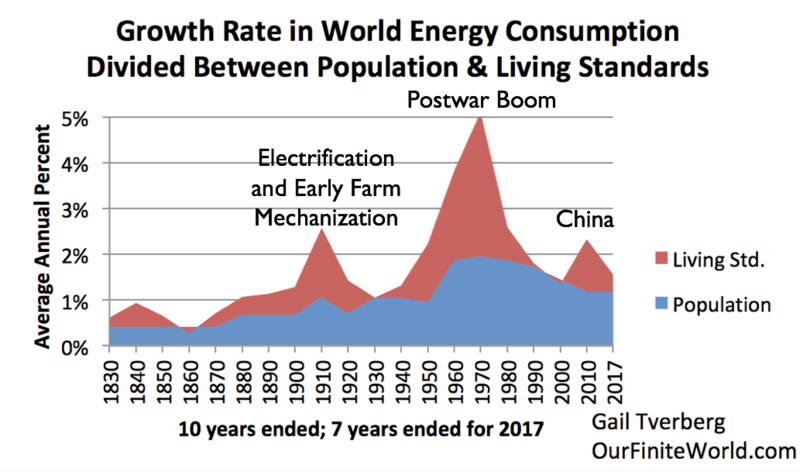 During the boom period when energy consumption was growing rapidly, it was perfectly possible to move from poverty to riches. Now it is not any more. In fact, the moves for young people are generally the other way. 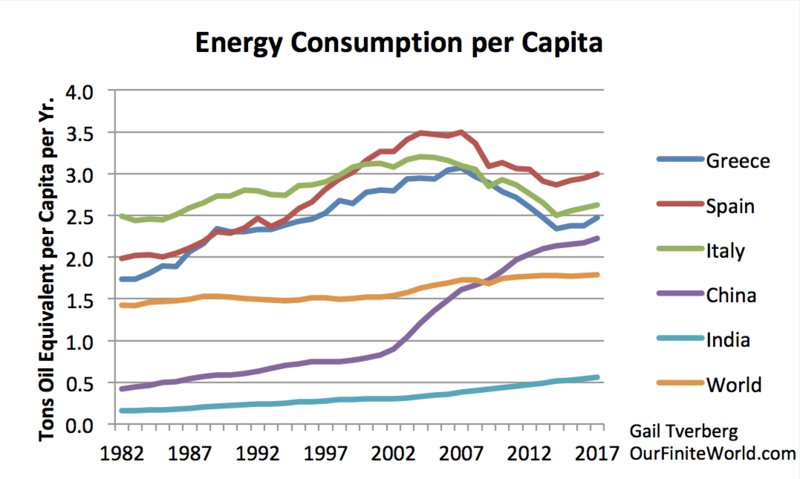 This is a statement about energy consumption per capita, and how it is trending. It is not a statement about faith in a system, or leadership. People are starting to believe in fairy tales. That “other peoples money” can be used to raise everyone’s standard of living. Ignoring that the “other people” will go broke and no longer be able to subsidize the rest. Ignoring the fact that it isn’t money that makes prosperity – it is resources (and in a large part energy resources) that allow prosperity. “Many are looking for change…” – Yes, American’s are looking for unicorns and fairy tales to save them. It is cheap energy and resources (and only that) which has the power to create positive changes. Not politicians. Not promises. Not hope. Not dreams. If you could vote for prosperity we would have that in spades by now. •The White House has rejected a trade planning meeting with China this week due to outstanding disagreements over intellectual property rules. •Should Beijing and Washington fail to agree on a permanent solution by March 1, President Donald Trump has said he will reinforce punitive tariffs. You’d think from the latest articles, that the US & China had pretty much agreed on enough points in their dialogue to draw the conclusion the trade war was imminently close to being over. Ah, no, it’s not as we can see from the above article. My view on this is the same as it is for North Korea, although different situations, the Asians are great at pretending to agree, but in reality that’s only to placate a person or country into thinking things are rosy when in fact they are no closer to a deal. It’s the fine art of lulling the opposition into a state of complacency, then when asked to sign, they say, oh, not so fast, maybe we talk over some more. And that idea that China will go on a spending spree to even out the trade deficit – Just more jockeying to pretend it’s all good. Guaranteed that’s a ploy. They might buy some stuff but as the months pass the trade deficit will be right back to where it has been recently. Electric vehicles (EVs) today are not the end of global oil demand growth, nor are they the key solution to reducing carbon emissions, Fatih Birol, the Executive Director of the International Energy Agency (IEA), said during the ‘Strategic Outlook on Energy’ panel at the World Economic Forum in Davos on Tuesday. According to Birol, analysts need to put things into perspective and consider that five million EVs globally is nothing compared to 1 billion internal combustion engine (ICE) cars. do you think she clutched her pearls? Excellent article but I always find it fascinating how the Elites who got rich off the backs of the Plebs are now worried about social unrest. I bet not one of them would give back their wealth to the poor. It’s all words, symbolism over substance. I recently read a Hugo Salinas Price interview and he too said that he was worried about the future. His remedy to bring the world back into balance is for the “poor” to accept that there will always be two claases, i.e. the Rich vs the Poor. Sometimes you just can’t makethis stuff up. That’s how the Elite think and people are starting to get fed up with the BS, hence why we’re seeing protests perculating aroundthe world. Zimbabwe is quickly turning into another Powder Keg and the Gov’t is fighting back the protest with violence. I do hate it when people say “violence solves nothing”; violence solves everything! That’s why our governments use it against us in such a heavy-handed manner. Schlumberger’s chief executive also warned that the shale industry could see other problems going forward that could be even more significant. 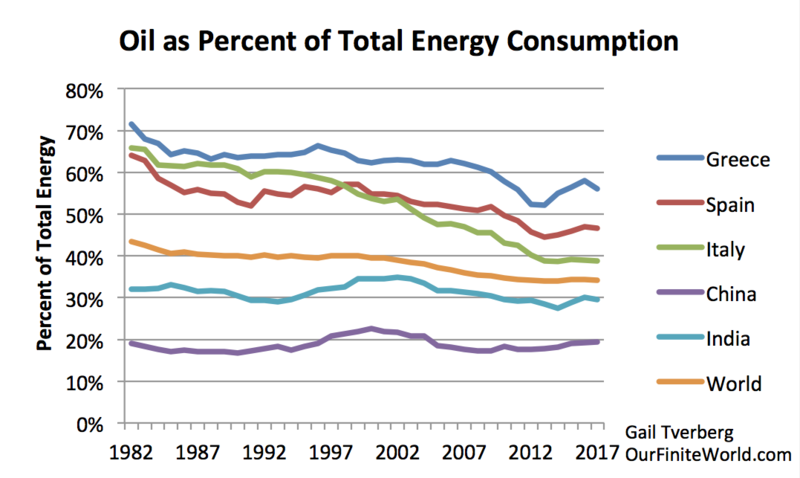 Shale drilling suffers from a precipitous decline in output soon after a well is completed. 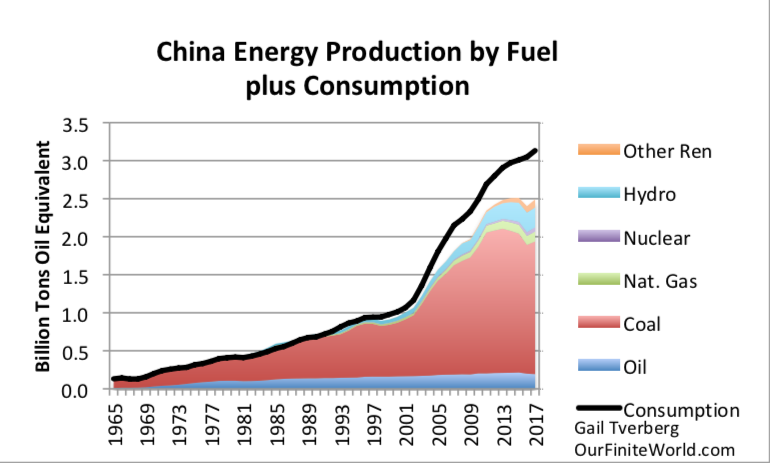 After an initial burst in output, wells see a rapid decline in production. This is not news; it has characterized shale drilling for years. Beyond that, well interference is also a mounting problem. Drilling wells too close to one another can cannibalize production, raising costs and leading to less overall output. That becomes a larger problem over time after companies pick over the best acreage. Additionally, the length of laterals and the use of frac sand and other proppants have reached the limits of what they can achieve. “We could be facing a more moderate growth in U.S. shale production in the coming years than what the most optimistic views have been suggesting,” Kibsgaard warned. All true baby doomer. M&A of the small shale players seems to be picking up in the shale patch by the big boys who have upstream and downstream businesses as well as conventional crude to mix in with the thin volatile frac oil and hide the money losing in the opaque paperwork and letters to investors. This should keep fracing going for a while that is until the rest of their business model falls apart. But what else is Exxon or BP supposed to do? Get into money losing production sharing arrangements with unreliable and fragile National oil companies in the ME? I suppose it is the lesser of 2 evils and hoping to hang on until oil prices finally go through the roof and save them. “That we cannot afford our economy is its immediate vulnerability. Asymmetries within the lending regime such as maturity mismatches make it fragile. The regime depends on a marginal agent or class of agents that sets conditions for all the others. Keynes notwithstanding, a certain level of borrowing restraint, something short of universal borrowing has little affect on the system as a whole. But, some percentage of economic agents must borrow with a fraction of that borrowing deployed to service and retire existing debts. Small leaks- or water over the top of a dike will not damage it but one small leak too many will wash the dike away. In the same way, a small percentage of non-performing loans or defaults is tolerable to the system, a portion of lender reserves and equity is set aside to resolve these as they appear. Then, there is one default too many for whatever reason … this is disaster! The ‘capital’ structure of the lender is upset; this calls into scrutiny the capitalization of all other lenders that are similarly situated. 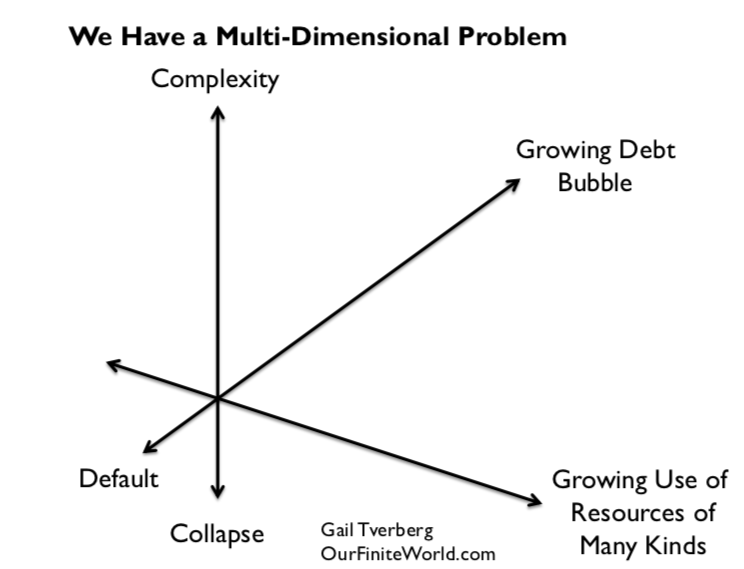 Uncertainty is rapid and corrosive, given time it widens into a self-amplifying spiral of insolvency. 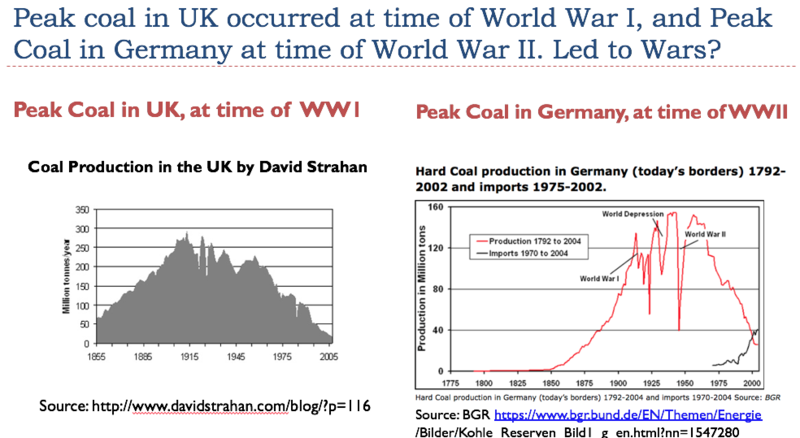 This is what occurred in 1929 and 2008 and what looks to be underway right this minute. Compounding the problem, the marginal borrower is impossible to identify or for immediate institutional convenience is disregarded. The tiny leak with the potential to destroy the dike can be one of any (very large) number. Globalization has rendered the marginal agent opaque; official denial and central bank happy talk permits known problems to fester. The marginal borrower can be an individual or a firm, or a class like Chinese peer-to-peer lenders, Italian footwear manufacturers or Spanish residential real estate speculators and the banks that supply these with funds. Eventually, all of them together become marginal. Structured finance operates outside the reach of policy makers at the same time are tightly bound to all the others by way of swaps, corresponding- and exchange lenders, counterparty agreements, derivatives-based hedges and money markets. 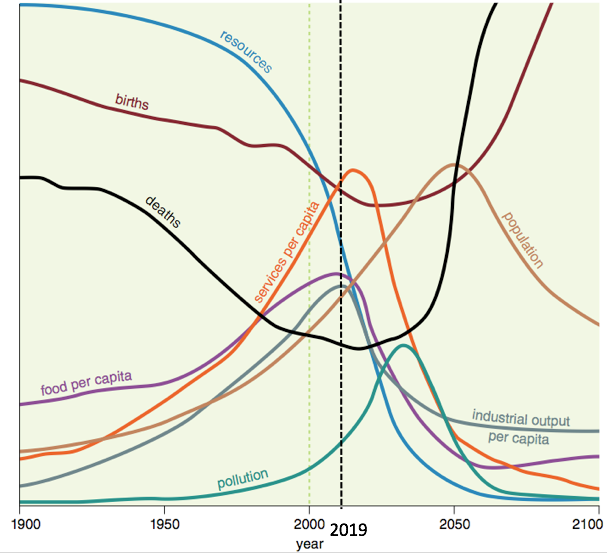 Like a flood, marginality propagates outward, with the ‘new’ marginal borrowers becoming major banks, dark money pools, bond- and derivatives market makers, national governments and foreign exchange. In any event, agents cannot be compelled to borrow and in a crisis refuse to do so. Insolvent, zombie-like walking dead firms which continue to borrow/lend in the aggregate are lethal to the regime: they can only offer the (fraudulent) appearance of a cure while delaying the inevitable reckoning. Accounts cannot be overdrawn indefinitely, it is impossible to borrow out of debt. “If something cannot go on forever, it will stop,” says economist Herbert Stein. No amount of marginal borrowers can rescue a system that is foundationally bankrupt. … this is after hundreds of trillion$ have been borrowed around the world already. The simple fact of the trillions suggests the managers are inept and perhaps insane. Our debts have grown beyond human scale, even the billionaires all together cannot hope to retire them, in fact their borrowings have contributed significantly to the total. Along with their managers, these stupendous debts fade to irrelevance in the practical sense; they can never be repaid. They are empty claims against resources that have long since been converted into useless waste. Machines that are dependent upon credit for their very existence cannot repay, certainly not labor which is feeble; which is otherwise depreciated, subordinated and oversupplied. Basically, the world waits till the moment as “the US alliance” is no longer preferred host nation of the global debt system, what happens afterwards is unknown, it could be anything from nuclear, biogerm wars to mere econ/social implosion and attempted lower plateau elsewhere with at least some JITs stabilization for few selected powers and their respective population.. for a while.. Understandably nothing exciting to visualize (and act upon) for anybody concerned vs. today’s opulence and cat fights, hence the very protracted and dragged timeline so far..
Lots of people are depending on this system, for their bank accounts and for their pensions. A person wonders what part will fail first. Derivatives seem like a likely candidate, but just plain rising default levels could push the system over. One married couple in Slovakia, who tried to organize a lottery in a village (where, by the way, a landslide damaged a part of the village), got a fine from the authorities amounting to EUR 32.000.